The National Academy of Sciences (NAS) is the U.S.-adhering member of the International Science Council (ISC), a non-governmental organization designed to advance, serve, and enable science. The ISC provides a wide spectrum of scientific expertise, enabling members to address major international, interdisciplinary issues. Membership in ISC consists primarily of national members (multidisciplinary scientific academies or research councils) and scientific union members (international, disciplinary organizations). For more information on the membership of BISO, please consult the BISO membership webpage. monitoring the activities of the ISC. BISO Board Members and Director at the 2017 ICSU General Assembly. From left to right: Kennedy Reed, Marvin Hackert, Patrick Scott, John Hildebrand, Kathie Bailey, Melody Brown Burkins, and Michael Clegg. 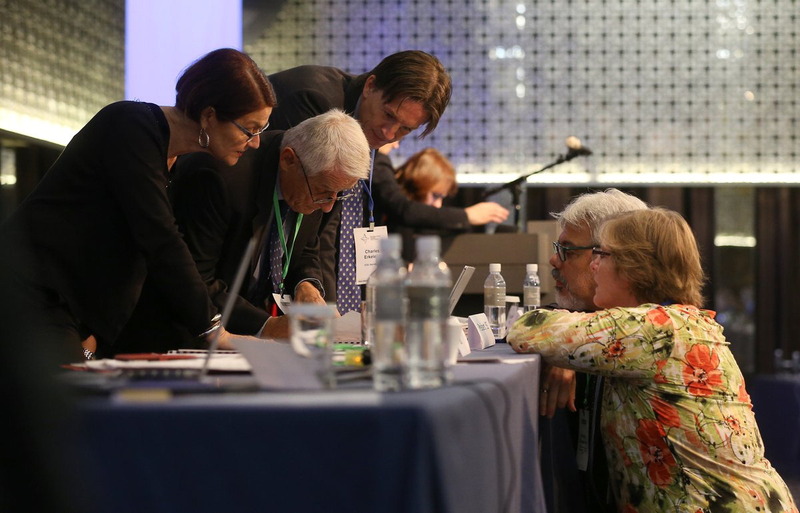 Following approval of the merger of the International Council for Science (ICSU) and the International Social Science Council (ISSC) by the memberships of both organizations in October 2017, an inaugural General Assembly of the new organization, the International Science Council (ISC), was held in Paris, France on July 3-5, 2018. The U.S. delegation consisted of John Hildebrand (chair), Robert Axelrod, Melody Brown Burkins, and Emilio Moran. Under French law, all members of either organization automatically become members of the new merged organization. The NAS is the only national member of ICSU. The U.S. has no national member in the ISSC. Current dues for all members will be maintained through 2021, although a small annual inflationary adjustment will be applied. A dues committee will be formed to determine a new structure and recommend new dues levels. More details about the merger can be found at https://www.icsu.org/current/news/the-icsuissc-merger-explained. 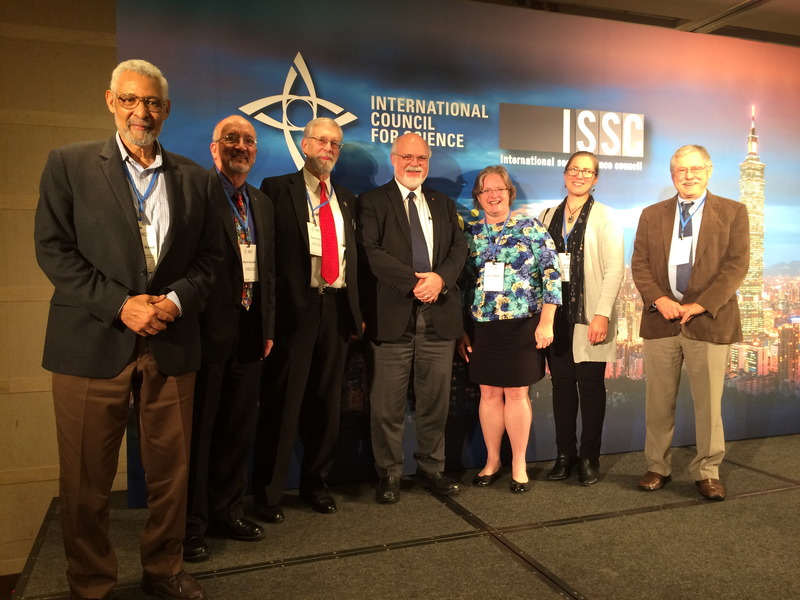 Why does the ICSU-ISSC Merger Matter? ICSU’s 2014 external review also recommended that (ICSU) and several closely-allied organizations, including the International Social Science Council (ISSC), the InterAcademy Partnership (IAP), and The World Academy of Sciences for the advancement of science in developing countries (TWAS) find a way of speaking with a common voice on important themes. Science International (http://www.science-international.org) was the result. It is a platform through which the four organizations can speak with one voice. The first Science International accord was released in December 2015 and addresses big data/open data. It proposes 12 principles to guide open access to big data. A four-page summary of Open Data in a Big Data World can be found here. For the full version, click here. A second statement regarding refugee scientists is being discussed. In September 2016, ICSU was involved with the 2nd International Science Advice to Governments conference in Brussels, Belgium. More than 600 policymakers, practitioners and scientists from 72 countries discussed the needs and opportunities associated with providing scientific advice and evidence into the policy process. The conference was organized by the International Network on Government Science Advice (INGSA), which operates under the auspices of ICSU, and the European Commission. A report of the conference can be found on the ICSU webpage at http://www.icsu.org/news-centre/news/top-news/2nd-international-science-advice-to-governments-conference-concludes-in-brussels. ICSU released an advisory note calling for “more effective strategies to promote gender equality and equitable access to all resources in the practice of science, notably in the area of field research, and to remove barriers to the full participation in science by women.” The advisory note “Mobility and Field Research in the Sciences: Gender Equality and Prevention of Harassment” is available here. The statement grew out of a workshop organized by ICSU’s Committee on the Freedom and Responsibilities of Science (CFRS), the Mexican Academy of Sciences, and ICSU Regional Office of Latin America and the Caribbean (ROLAC) on “Gender Issues in Field Research: Mobility and Internationalization of Science”. The workshop was held in Mexico City in April 2016. This advisory note is closely related to and based on ICSU’s Statute 5 on the Principle of Universality of Science.